Oh man, The Family Fang. Caleb and Camille Fang are performance artists who create "events" that shock and awe unsuspecting passersby. Their children, Annie and Buster, are unwilling participants in their mayhem which takes a toll on their psyches as they transition from childhood to adulthood. As adults, their lives begin to unravel and they move home temporarily, only to find their parents haven't changed -- and yet, their art has an entirely new goal. 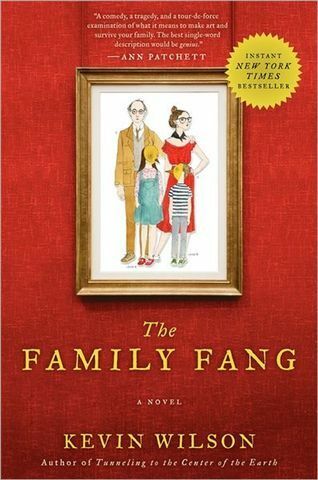 Plot: The book is fairly character-driven and I had trouble understanding how on earth anyone considered the Fang events "art" to the point that these people became rich off of it. Which brought up an internal debate on the relevance and legitimacy of performance art. But aside from that and the insanity of Caleb and Camille, the plot is humorous and moves quickly. As it builds to the end it also becomes quite the page turner. Caleb and Camille are unpredictable and while you feel like you know where the plot may lead, you also know that it won't be what you expect. Characters: These parents are cray-cray. Fo' real. The things they subject their children to are ridiculous and in some cases, deplorable. So, I wasn't a huge fan of them. But Annie and Buster are complex characters that are fun to watch. You'll meet them at fairly low points in their lives and you'll wonder why you should care about them, but by the end you'll be cheering for them. All in all, I enjoyed it, despite the horrid parents and their outlandish sense of reality. 4 stars. I read a review on NPR and couldn't decide if the antics of the parents would be interesting or just annoying--after reading your review, I think I'll give it a shot! I haev to say that for me, they were more on the annoying side. I did not like how they used their children as pawns and I didn't understand how the heck what they did was considered "art". But, I enjoyed how the children evolved despite their parents' antics. Fun read, quirky and kinda clever. The author draws the reader into the mystery that drives the story, which is as unpredictable as it is endearing. With page-turner pacing, this less-than-cerebral black comedy is an engaging and easy story you're not likely to forget soon.